Grab your guests attention with this white finished hall console accent table. This sturdy 32" long solid-wood table has symmetrical lines and a unique flair. Great for displaying pictures, decorative pieces or books, this piece is sure to be a great addition to your hallway. Grab your guests attention with this white finished hall console accent table. This sturdy 32" long solid-wood table has symmetrical lines and a unique flair. Great for displaying pictures, decorative pieces or books, this piece is sure to be a great addition to your hallway. Within a compact space, choosing the right pieces of furniture is crucial in order to feel relaxed and comfortable. Maximize every square foot of your room with Bestar's Small Space units! Durable 3/4 inch yellow birch top surface. Thanks to the Lift-top mechanism, you can quickly and quietly adjust the top surface from standard (15 inch) to elevated (23 inch) position. Lift-top functionality allows dining and working while enjoying the comfort of your sofa. Large storage compartment the under table top to keep you organized. The 2 open compartments are accessible on both sides of the table. Assembly Required. Accent Table - 32"L / White Hall Console Grab your guests attention with this white finished hall console accent table. This sturdy 32" long solid-wood table has symmetrical lines and a unique flair. Great for displaying pictures, decorative pieces or books, this piece is sure to be a great addition to your hallway. 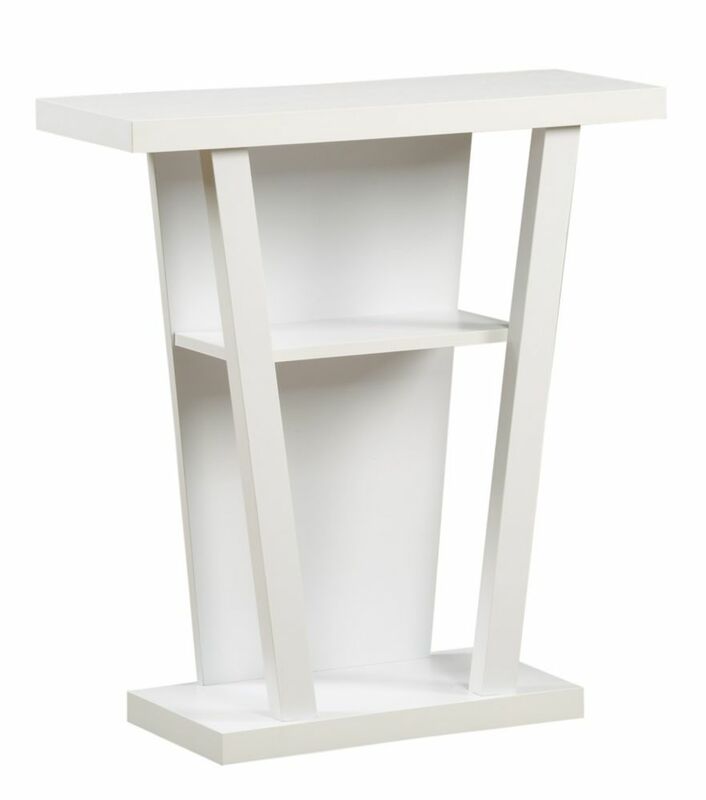 Accent Table - 32"L / White Hall Console is rated 5.0 out of 5 by 1. Hello Step, this console table is made from MDF &amp; Hollow core. It has a laminate coating. It may be okay to roughly sand and paint with the right type of paint. You would need to test it in a small inconspicuous area first. You couldn't stain it. If you're looking for something a bit more rustic, you may want to consider this taupe wood-look finish under item I 2453 (same item): https://www.homedepot.ca/en/home/p.accent-table---32-inch-l--dark-taupe-hall-console.1001068609.html?searchterm=I%202453. We hope that helps. Thank you.